Official station: M. of G.
He was buried in Brown Cemetery, Bow, Merrimack County, New Hampshire. Harrison Colby, A genealogy of the descendants of Abraham Colby and Elizabeth Blaisdell, his wife, who settled in Bow in 1768, , at https://archive.org/details/genealogyofdesce00colb . Concord, N.H.: Printed by the Republican Press Association, (1895) Microfilm #896944 of the Family History Library, Salt Lake City, Utah, p. 16. 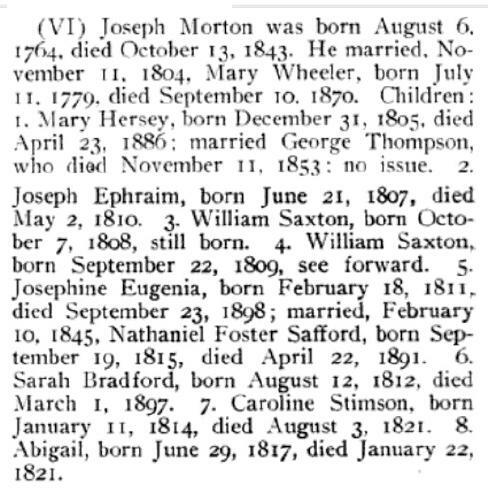 "Massachusetts Deaths, 1841-1915," database with images, FamilySearch (https://familysearch.org/ark:/61903/1:1:N7KZ-NRK : 10 December 2014), Mary Wheeler Morton, 10 Sep 1870; citing Milton, Norfolk, Massachusetts, v 230 p 268, State Archives, Boston; FHL microfilm 960,196. 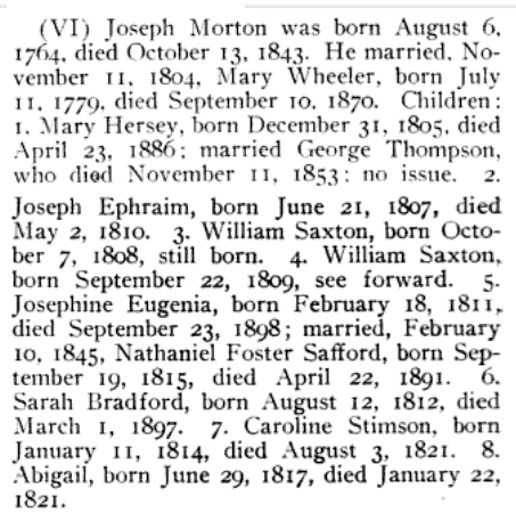 COLBY FAMILY & OTHERS at http://freepages.genealogy.rootsweb.com/~colby/colbyfam, /d300.html citing FHL Number 1001263; Birth and Marriage Index for New Hampshire. COLBY FAMILY & OTHERS at http://freepages.genealogy.rootsweb.com/~colby/colbyfam, citing FHL Number 1000976; Marriage: Rachel WHEELER, Date: 31 Dec 1818; Recorded in: Birth and Marriage Index for New Hampshire. COLBY FAMILY & OTHERS at http://freepages.genealogy.rootsweb.com/~colby/colbyfam, /d110.html. Harrison Colby, A genealogy of the descendants of Abraham Colby and Elizabeth Blaisdell, his wife, who settled in Bow in 1768, , at https://archive.org/details/genealogyofdesce00colb . Concord, N.H.: Printed by the Republican Press Association, (1895) Microfilm #896944 of the Family History Library, Salt Lake City, Utah, pp. 142-3. Harrison Colby, A genealogy of the descendants of Abraham Colby and Elizabeth Blaisdell, his wife, who settled in Bow in 1768, , at https://archive.org/details/genealogyofdesce00colb . Concord, N.H.: Printed by the Republican Press Association, (1895) Microfilm #896944 of the Family History Library, Salt Lake City, Utah, p. 142. John A. Schutz, Legislators of the Massachusetts General Court, 1691-1780: a biographical dictionary, , at https://books.google.com/books?id=eKPU-Drsc_UC . Boston: Northeastern University Press, (1997) , p. 355. Henry Stedman Nourse, History of the Town of Harvard, Massachusetts: 1732-1893, Harvard: Warren Hapgood, (1894) , Vol. 2, p. 536. COLBY FAMILY & OTHERS at http://freepages.genealogy.rootsweb.com/~colby/colbyfam, /d496.html. Susan married Moses C. Elliott, son of David Elliot and Anna Colby, on May 26, 1823 in Goffstown, Hillsborough County, New Hampshire, by Benjamin H. Pitman, Congregational clergyman.